The original book sold several hundred thousand copies, and we've done an initial print run of 10,000 copies for this new Moth Book (which is flying off the shelves!) It is bigger and therefore it is heavier, with postage at 68p, all we're asking Dry Cleaners to pay for a copy is 99p to cover postage & packing (excl. VAT)! The retail value of our book is £9.99 so this is a deal not to be missed! The first edition was written in 2013, but now 5 years later the new Caraselle Moth Book - “What’s Eating You 2?” Mothmageddon, is an 80 page, A5 sized book full of the most up to date information about Moths and how to get rid of them! "Heatwave serves up a jumper feast for moths"
"The fabric of the nation is under attack – from a plague of clothes moths"
Don't spend any more time in the dark, educate yourself and your staff with this new Moth Book. You and your staff can become better educated to explain how your customers can get rid of Moths and why they should purchase your Moth Killer products. Remember“What’s Eating You 2?” Mothmageddon is exclusive to Caraselle, your customers won't have been given information such as this and by raising your game you will be providing them with the help they want but aren't getting anywhere else. Not only that, the upsell from Moth Killers is huge and information in our new Moth Book is the first invaluable step that Customers are looking for in their fight against Moths. 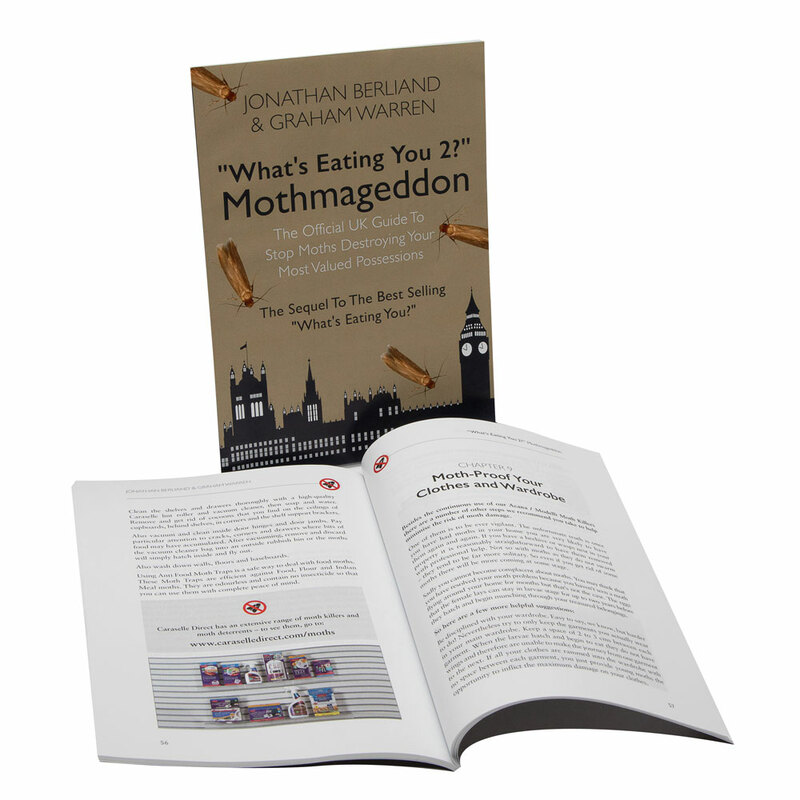 Moth Killers are big business and this book will give you the ammunition to double or triple your sales... become an expert on Moths with “What’s Eating You 2?” Mothmageddon.